One of the most amazing hikes in Zion National Park is The Narrows. 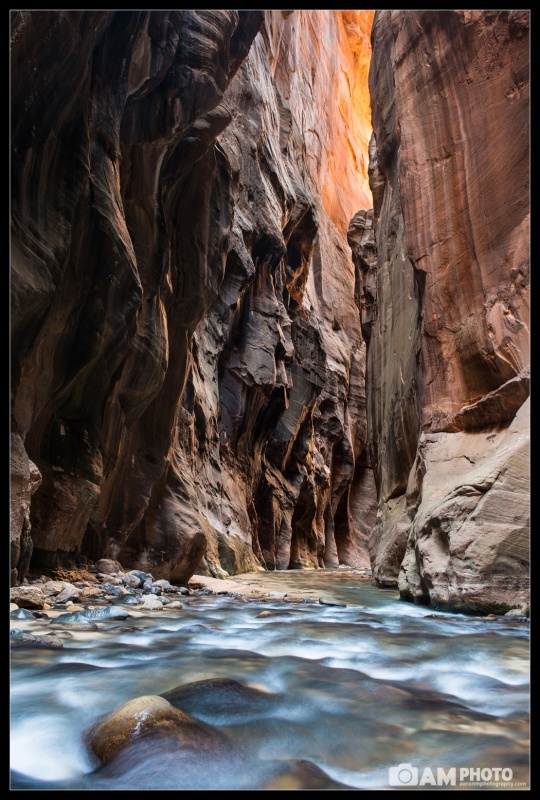 Once Willie, Yan, and I donned on our drysuit pants, neoprene socks and canyoneering shoes we trudged 9 miles up and down the Virgin River through this beautiful slot canyon. In the morning the suns rays bounce off the red rock walls, causing them to glow with beautiful color. After finding the end of Wall Street we hiked back towards the beginning and found some beautiful light, which we photographed for a while. Another photographer had already been there and informed us that even though it was still only 10:30am, we had missed the good light back at the end of Wall Street. We didnt believe him so we raced back to the end of Wall Street only to find out that he was right. We went in search of some more of the good light, which seemed like it was further towards the beginning of Wall Street. On our walk back towards the beginning we found this small section of canyon wall that was just glowing with beautiful orange color. We stopped and used the water flowing around the rocks as a foreground element.